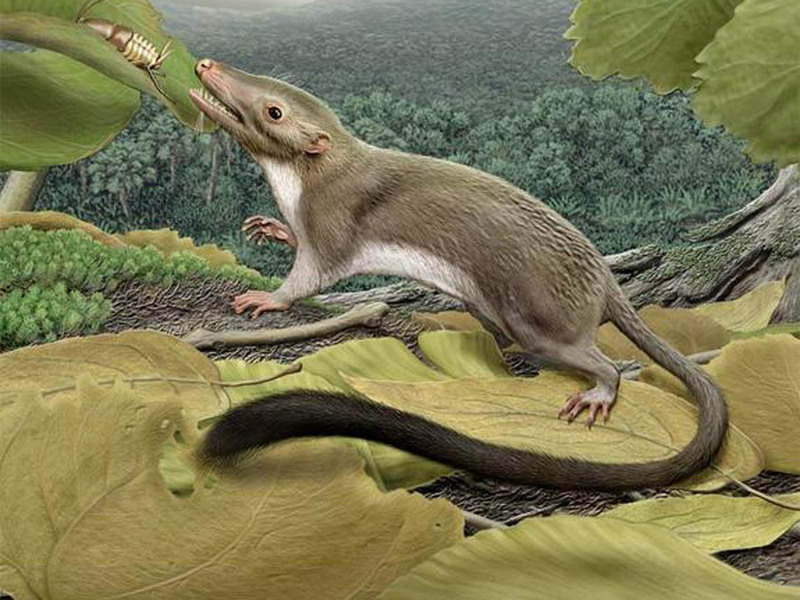 A tiny, furry-tailed creature is the most complete picture yet as to what the ancestor of mice, elephants, lions, tigers, bears, whales, bats and humans once looked like, researchers say. "Species like rodents and primates did not share the Earth with nonavian dinosaurs, but arose from a common ancestor -- a small, insect-eating, scampering animal -- shortly after the dinosaurs' demise," said researcher Maureen O'Leary at Stony Brook University in New York. The study was so thorough that the team, made up of 23 scientists from around the world, was able to speculate on the appearance of this hypothetical ancestor inside and out, from its brain and inner ear bones to its ovaries and even what its sperm may have looked like (it sported a head and tail like modern-day sperm cells do). "There are over 5,100 living placental species and they exhibit enormous diversity," said researcher Nancy Simmons at the American Museum of Natural History. Much remains controversial about the origins of placentals, such as when they arose and how they diversified. Fossil evidence suggests they evolved after the end-Cretaceous mass extinction event about 65 million years ago that ended the age of dinosaurs; and the "explosive model" based off this data proposes that placental lineages emerged and diversified to fill niches left vacant after this catastrophe. However, genetics research suggests placental lineages were actually far older, hinting their diversification was linked to the breakup of the continents before the end of the Cretaceous period. "In the field of mammal research, there had been a big divide between people working with DNA and others working on morphology," said researcher John Wible at the Carnegie Museum of Natural History in Pittsburgh. The molecular team gathered DNA sequences of living animals while the morphology team analyzed the anatomy of both living and extinct mammals. The molecular team was limited largely to living mammals, because researchers currently cannot extract genetic material from fossils more than 30,000 years old, so morphological data was key when it came to exploring more ancient branches of the mammal family tree. "Discovering the tree of life is like piecing together a crime scene -- it is a story that happened in the past that you can't repeat," O'Leary said. "Just like with a crime scene, the new tools of DNA add important information, but so do other physical clues like a body or, in the scientific realm, fossils and anatomy. Combining all the evidence produces the most informed reconstruction of a past event." When it comes to studying morphology, a dataset of 500 anatomical characteristics, or "characters," is often considered large. However, for this new project, the researchers generated a groundbreaking 4,500 characters using a cloud-based and publicly accessible database called MorphoBank. "We couldn't have accomplished this without MorphoBank," said researcher Michelle Spaulding at Carnegie Museum of Natural History. "This website allowed members of the team, spread all over the globe, to work simultaneously." Combining both DNA and morphological datasets led to an unprecedented amount of information for each of the 83 mammals they investigated. "It's not that we hadn't combined morphology with DNA before," Spaulding said. "This time, we ratcheted up the amount of morphological detail phenomenally, providing a larger anatomical base for the study as compared with DNA than is typical." From all this data from living and extinct mammals, the scientists extrapolated the appearance of the most recent common ancestor of all placental mammals. "We have all these placentals alive today, from elephants to shrews, from things that fly to things that swim," Spaulding said. "What could the common ancestor of these things that are so different possibly look like?" The scientists then worked with an artist to illustrate this ancestor. In addition to a furry tail, the researchers suggest the four-legged creature likely ate insects, weighed from 6 grams (about the weight of some shrews) up to 245 grams -- less than half a pound -- and was more adapted for general scampering than built for more specialized forms of movement, such as swinging from trees. Also, its cerebral cortex -- the part of the brain linked to higher mental processes -- was probably convoluted, folds linked with greater brain activity, the researchers found. Their research also suggested placental mammals appeared after the end of the age of dinosaurs, with the original ancestor developing about 200,000 to 400,000 years after the event. "This is about 36 million years later than the prediction based on purely genetic data," said researcher Marcelo Weksler at Brazil's National Museum at the Federal University of Rio de Janeiro. This supports the notion that the mass extinction was a critical event in mammalian evolutionary history. "The diversification of placental mammals was not tied to the breakup of continents from a supercontinent, Gondwana," O'Leary told LiveScience. The discrepancy between these findings and past research that looked only at genes is the result of the way genetic studies "assign a rate of change to genes through time," O'Leary explained. "A weakness of that approach is that it involves many assumptions about rates of gene change through time." In the future, "I will continue looking for key fossils from the Late Mesozoic and Early Paleogene that help us contribute even more to this family tree," O'Leary said. "I have been working in Africa to make such discoveries with projects in Mali and Senegal. I plan to continue trying to make fossil discoveries that expand the placental mammal family tree."